Any American traveling in the world today will come across the Paris Herald somewhere, though it now goes under the name the International New York Times. Never mind, at heart it is still the Paris Herald and traces its roots to Paris at the beginning of the 20th Century when it was as familiar in the kiosks of the Left Bank and the Champs Elysees as the latest article in l'Aurore by Zola or newest installment by Proust in his never ending search for lost time. The Paris Herald, narrative historical fiction, tells the story of the world's most famous newspaper, focusing on the key years of the 1960s, when the fates of the newspaper and of the regime of Charles de Gaulle became curiously intertwined. The story centers on intrigue and rivalry among the New York Herald Tribune, New York Times and Washington Post. When the Herald Tribune ceased operations in New York in 1966, the Times, which had started its own European Edition in 1960, expected the Paris Herald to close, too, giving the Times victory in Paris as well as New York. But Herald Tribuneowner Jock Whitney wouldn't sell to the Times, preferring to join with Katharine Graham, who'd taken charge at the Post after her husband's death. Within months, the Times came, hat-in-hand, offering to close its European edition and asking to buy into the new Herald/Post partnership. The Times neither forgave nor forgot its humiliation. The Paris Herald is the story of many people: of Frank Draper, who fought in the Lincoln Brigade; Byron Hallsberg, who joined the Hungarian uprising; Dennis Klein, researching the Nazi occupation of Paris; Suzy de Granville, searching for family roots; Wayne Murray, escaping homophobia; of Steve and Molly Fleming, living the high life; Sonny Stein and Al Lodge and Connie Marshall and Ben Swart and Eddie Jones, paperboy, all finding themselves at the Paris Herald for their own reasons and ending up in the fight to keep the newspaper alive. Since being founded in 1887 by James Gordon Bennett, Jr., the Paris Herald has been essential to American expatriate life in Europe. In France, many Americans put down roots, married into French families and became permanent expatriates, in some cases exiles, like Bennett himself. The tense events of the 1960s touched the lives of every American in Paris, including many well-known artistic exiles: James Baldwin, Art Buchwald, William Saroyan, James Jones, Bud Powell, Dexter Gordon, Kenny Clarke, Joe Turner, Memphis Slim. As the crisis deepened, one shadowy man became the link between de Gaulle and the troika of newspaper owners, Whitney, Graham and Arthur Ochs Sulzberger. This man, Henri de Saint-Gaudens, a high French official in the Elysee Palace, understood the Herald's historical importance to Paris. 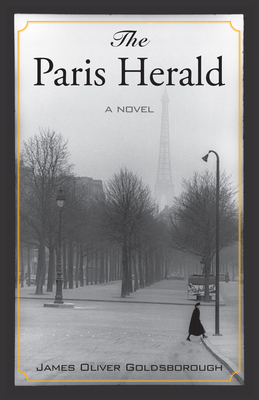 The Paris Herald, a novel, is riveting historical drama, as relevant today as yesterday. It is a story never before told. James O. Goldsborough is an award-winning writer with a 40-year career in journalism, specializing in foreign affairs. "The Misfortunes of Wealth: A Family Memoir," dealing with the disadvantages of inherited money, was published in September, 2008. James Goldsborough spent 15 years in Europe as a foreign correspondent for the New York Herald Tribune, International Herald Tribune, Toronto Star and Newsweek Magazine before returning to America to resume his newspaper career as an editor and columnist for the San Jose Mercury-News and San Diego Union-Tribune. Currently, he writes a column for the Voice of San Diego, a new on-line daily newspaper in San Diego that has attracted national attention for news innovations.James Goldsborough was named the Edward R. Murrow fellow at the Council on Foreign Relations for the year 1973-1974, and served as senior associate and director of European projects at the Carnegie Endowment for International Peace in 1979-1983. While at Carnegie, he wrote "Rebel Europe: How America Can Live with a Changing Continent" (Macmillan, 1982). The book was acclaimed by Sen. J.W. Fulbright, chairman of the Senate Foreign Relations Committee, as "the most perceptive and profound analysis of the reasons why the influence and prestige of the United States have suffered such a decline during the last twenty years." Goldsborough has written on foreign affairs for many leading magazines (see links) including Foreign Affairs, the New York Times Magazine, Foreign Policy, Fortune and the Columbia Journalism Review. In addition, he has written monographs for the Chicago Council on Foreign Relations and the Henry L. Stimson Center. His monograph for the Stimson Center - "CNN Effect? The Media's Role in Foreign Policy" - is a thorough examination of the interaction among media, public opinion and policy makers in the shaping of foreign policy.He is a 1958 graduate of UCLA with a bachelor's degree in economics and attended law school at the University of California's Boalt Hall. He has also attended Mexico City College and the Goethe Institut in Berlin. He is fluent in French, German and Spanish. In 1958-1960 he served in the U.S. Army, attached to Special Services.Goldsborough was a member of the Council on Foreign Relations, 1974-1991; officer of the San Diego World Affairs Council, 1995-2001; member of the World Affairs Council of San Francisco, 1984-1986; co-founder of the World Forum of Silicon Valley, 1986; member of the Edward R. Murrow Selection Committee at the Council on Foreign Relations, 1981-1984, and board member of the American School in Paris, 1976-1979. He resides in San Diego. The Paris Herald is his first novel.